Are you thinking about buying a brand new Hartman Berkeley furniture set but want to find out a bit more before you place your order? Our video looks at all of the key features you can expect to find on a 2019 Hartman Berkeley furniture set! Berkeley is a modern style furniture range that features a simple lattice design on its chairs and tabletops. It is made from cast aluminium which ensures that it is highly resistant to almost all weathers. It is lightweight, has stackable chairs and comes complete with Hartman's unique Weatherready cushions. Explore this fabulous range below. Sleek, stylish design, combined with robust functionality makes Berkeley a fantastic cast aluminium furniture range to purchase for your garden this year. Featuring a simple lattice design on its table tops and chairs, this Hartman cast aluminium garden furniture range is ideal for a wide variety of garden styles - from ultra-modern to traditional and quaint. 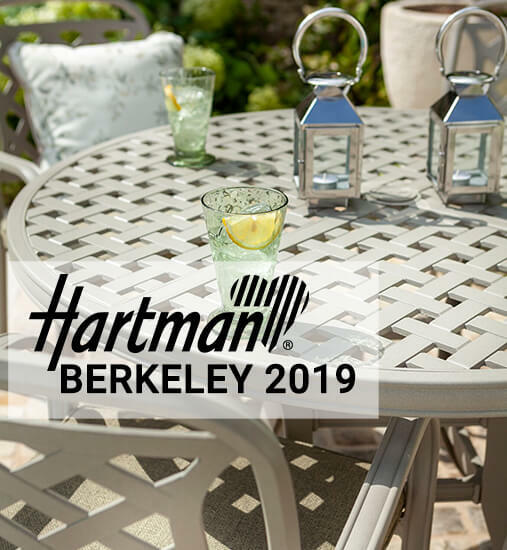 The Hartman Berkeley range includes dining sets of 4 - 8 seats, as well as smaller sets and accessories, such as two-seat bistro sets and benches. So whether you have an outdoor space that is large or small, you can rest assured there will be something to suit your garden. Thanks to its design, Berkeley is lightweight and durable. It has stackable chairs which mean that it's easy to store or transport when necessary. This range comes with Hartman's unique Weatherready cushions which can be left in place all summer long, making Berkeley furniture low-maintenance and easy to keep in fantastic condition. There is more choice than ever when buying a Berkeley cast aluminium furniture set from Garden4Less in 2019. This year, the range is available in three gorgeous colour combinations: Bronze & Amber, Antique Grey & Platinum and Maize & Wheatgrass. And not only are we stocking all of the brand new 2019 colours, we are also continuing to stock the highly-popular Midnight & Shadow colourway too!